Atlas is the leader in providing small benchtop photo stability exposure testing instruments based on preferred xenon arc lamp technology (Option 1) of the International Council for Harmonisation of Technical Requirements for Pharmaceuticals for Human Use (ICH) Guideline Q1B Stability Testing: Photostability Testing of New Drug Substances and Products. It is also used for testing to ICH Guideline Q5C Stability Testing of Biotechnological/Biological Products, VICH GL5 Stability Testing: Photostability Testing of New Veterinary Drug Substances and Medicinal Products (Revision), and other related standards. Active Pharmaceutical Ingredients (API) as well as the Final Pharmaceutical Product (FPP) must be tested for photostability according to the International Commission on Harmonization Guidelines and are adopted by the major governmental regulatory agencies. 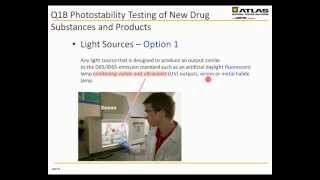 Atlas’ SUNTEST instruments meet the requirements for the Option 1 D65 and ID65 light sources, preferred by most researchers and the most cited in research publications, as they overcome the many limitations of the Option 2 fluorescent lamp based chambers. You can trust SUNTEST to provide accurate and defensible data for your regulatory filings, including packaging decisions and expiration dates. The SUNTEST CPS+ and XLS+ benchtop models provide the ideal size and capability for most pharmaceutical testing needs, including powders, solutions, tablets and capsules, injectables, packaging, etc. The SUNTEST XLS+ is the most used model as it has the chamber size to test blister packs, final packaging, and powders using our optional powder apparatus. An optional cooling system, SunCool, is recommended for lower test chamber temperatures for thermally labile API’s or FPP’s such as gel-caps. The larger SUNTEST XXL+ is sized for exposing larger scale specimens for stability testing of packaging and medical devices. The SUNTEST can switch between the D65 outdoor daylight to ID65 window glass filtered spectra with a simple optical filter change. This makes for more versatile testing options for meeting both the Q1B minimum confirmatory requirement testing as well as the forced-degradation requirement. The SUNTEST’s Option 1 xenon light source provides for rapid testing – confirmatory testing can be met in hours, not the week or more required by Option 2 sources, with both the ultraviolet (UV) and visible light exposures occurring simultaneously, with no need to switch lamps or run consecutive tests. The precision xenon light source fully meets the international D65 and ID65 spectral requirements, unlike many of the Option 2 fluorescent sources on the market, and has no potentially dangerous “wavelength gap” between the UV and visible light emissions. Regulatory and similar agencies which adopt ICH Guidelines in whole or in part, such as US Food & Drug Agency, European Medicines Agency, Japan Ministry of Health, Labor and Welfare, Health Canada, World Health Organization, European Free Trade Association, ASEAN, and others.